A true Ocean Racer / Cruiser in a 26 foot package. Five foot eleven headroom and lots of storage. 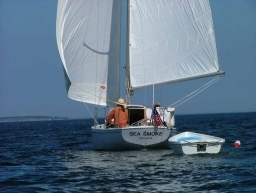 Sea Smoke is owned by Thomas Howe and Kate Dinneen who home port in Kansas with their Montgomery 17 - Hull Number 666 (really). The Pearson Ariel is kept in Rockland, Maine and was a participant in the 2005 Maine Cruise (album on this site). Thomas tells me it's a total of 1478 miles by GPS from his home to the mooring in Maine. Used to be family was there in Rockland which gave a good dual purpose reason to visit the boat, and mom & dad. But now they've moved, so visiting the boat is by special occasion. It's a great visit anytime they can make it. The harbor is excellent, lots of services with wonderful access to Penobscot Bay and points East.